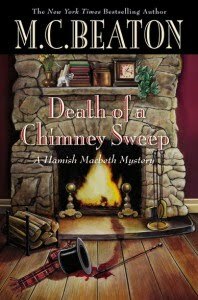 Death Of A Chimney Sweep: A Hamish Macbeth Mystery is number 27 in the series. In most parts of Scotland, folks have their chimney's vacuumed, however, in some of the more isolated villages, they still use the chimney sweep. In Lochdubh, Pete Ray is that man and he is called upon to clean the chimney of Captain Henry Davenport and his wife Millie. However, before the job is done, Pete is dead and the culprit in the murder of Captain Davenport. Hamish Macbeth has seen his fair share of crime and his tactics are his own, much to the chagrin of his supervisors. He sets out to solve the mystery surrounding the Captain and learns of the hidden plots and double dealings that the Captain has been involved with and with no murder suspect in sight, and with his boss wishing to remove him from the case, Hamish is put to the test as time is ticking away and bodies continue to turn up. This was my first Hamish Macbeth mystery, I'd heard some great things, but I was not impressed with this book at all. I found the characters wooden, their dialogue atrocious and confusing and the story was the same old, same old. The flow of the story was seriously lacking as dialogue between the characters were not differentiated and most times you weren't sure who was talking and where in the setting of the story you were. I did like Millie and her sister-in-law Philomena, but they weren't enough to keep this reader interested. If you like the Hamish Macbeth series, then I'm sure you won't want to miss this one, however, I'd choose another title in this series if its your a first time reader, I wouldn't want you to be put off from a series of books I've only heard great things about. This was not one of them! Another series to add to my growing list of things I want to read! Awesome!